Successfully Added Car DVD Player "Road Droid" - Android, 7 Inch Screen, GPS, DVB-T, WiFi, 3G, Bluetooth (1DIN) to your Shopping Cart. 1 DIN Car DVD Player with 7 Inch touch screen, running Android and rocking great features such as Wi-Fi, 3G connectivity, Bluetooth, GPS, DVB-T, RDS, DVD and more! This in-dash car DVD Player is the ultimate centralized solution for your in-car entertainment needs! The “Road Droid” is one of the most advanced car DVD players on the market. With an array of connectivity features such as Wi-Fi, 3G Internet and Bluetooth, the “Road Droid” is way ahead of its competition. On top of that, the region free DVD Player can play any DVD or CD and display the large 7 Inch flip out Screen. You can even watch TV with the built in DVB-T receiver! “Road Droid” runs two operating systems; Android and its own flash based 3D user interface. Android will allow you to install Apps from the Google Play Store and watch YouTube videos or surf the internet using 3G or Wi-Fi. The built in GPS will navigate you safely to your destination and a mini USB and connector for iPod/iPhone lets you hook up your phone or mp3 player to the “Road Droid.” Last but not least, two micro SD card slots let you expand the internal memory up to 8GB. As you see, this Car DVD player has truly unlimited connectivity possibilities. This high quality car entertainment system is now available at a low wholesale price. Order one today and we guarantee to ship your order out tomorrow. 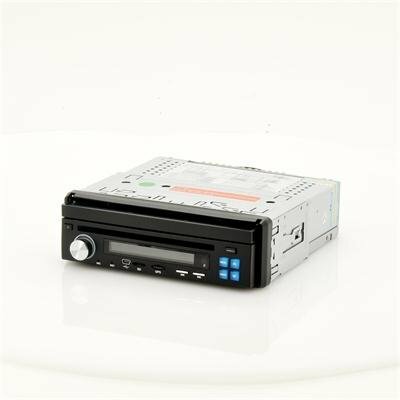 Brought to you by the leader in wholesale 1DIN Car DVD Players, Chinavasion. This model is compatible with most brands of GPS software - however hardware specific software such as Garmin may not run on this unit. As the wholesaler, Chinavasion provides the GPS-enabled hardware only, not the software. Chinavasion provides no warranty or customer support regarding GPS software. Chinavasion cannot provide downloads , links , advice regarding GPS software. Any software installation you undertake should be performed or supervised by a professional. Ho acquistato questo prodotto e mi è arrivato in italia dopo 8 giorni. Devo dire che è quasi perfetto. Installazione rapida, buone capacità audio e ottimo microfono. La chiavetta 3g non è il massimo della ricezione. Frontalino non estraibile e la più grave di tutte: l'impossibilità di installare google voice perdendo così la possibilità di comandare a voce molte applicazioni quali il navigatore e vari software di comando vocale. Semplici cose che avrebberò portato questo prodotto alla perfezione assoluta. Girano quasi tutte le applicazioni, ho dei problemi con l'installazione di Sygic e waze ha parecchi problemi. Google Navigator funziona alla perfezione. Spero che cinavasion rilasci un firmware che risolva questi problemi poiché porterebbe questo prodotto al top della gamma. Nonostante questi disagi mi sento comunque di consigliare questo prodotto. I purchased this product and I arrived in Italy after 8 days. I must say that it is almost perfect. Quick installation, good audio capability and excellent microphone. The key is not the best 3G reception. Panel is not removable and the worst of all: you can not install google voice losing the ability to control in many applications such as voice navigation and various software voice command. Simple things that would bring this product to absolute perfection. They run almost any application, I have problems with the installation of Sygic and waze has several problems. Google Navigator works perfectly. I hope cinavasion releases a firmware that solves these problems since this would lead to the top of the range product. Despite these hardships I still feel to recommend this product. Very good product all in one. but the sad problem is that there is not detachable panel. Power full for sound and very nice quality.